AAITF2015-This is not the end, it is another new beginning! The 11th China International Automotive Aftermarket Industry and Tuning (Shenzhen) Trade Fair（AAITF2015） was held successfully in Shenzhen Convention & Exhibition Center on 16th-18th, January 2015. AAITF 2015 covered the full range of automotive aftermarket products. According to feedbacks from most of our buyers, they are not only satisfied in new products released, concurrent events but also the services by AAITF organizer. In conclusion, they thought that AAITF2015 was an amazing show event which not only could fulfill their all year procurement requirements, but could learn more about the trends of automotive aftermarket industry, and looking forward to joining AAITF2016. All of the above mentioned has proved that the Venue Move Strategy from Guangzhou to Shenzhen was a great success, let’s hope for a better AAITF2016 upon the success of AAITF2015! 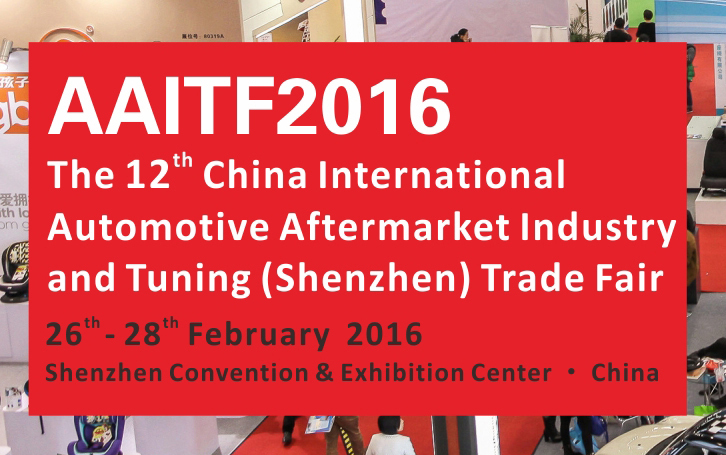 The 12th China International Automotive Aftermarket Industry and Tuning (Shenzhen) Trade Fair AAITF2016 will be held on 26th-28th, February 2016 in Shenzhen Convention & Exhibition Center. To aim at upgrading the resource integration of industry chain, building up the No.1 industrial brand exhibition group and the most comprehensive platform in automotive aftermarket industry.